A rectangular gilt-metal invitation box with an invitation from the the King and Queen of Thailand to Queen Elizabeth II and Prince Philip, 1972 State Visit. Pierced lid with blue, green and red enamel foliate scrolls with a Thai deity. Cardboard interior painted in gold. 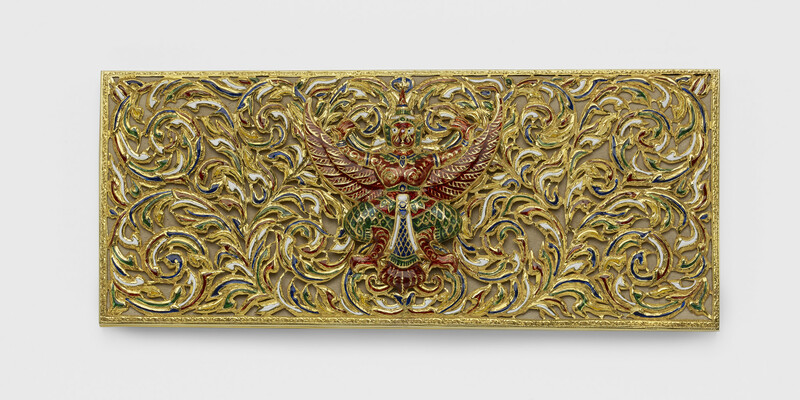 The lid of the box is decorated with the national emblem of Thailand, Phra Khrut Pha (Garuda as the Vehicle of Vishnu).